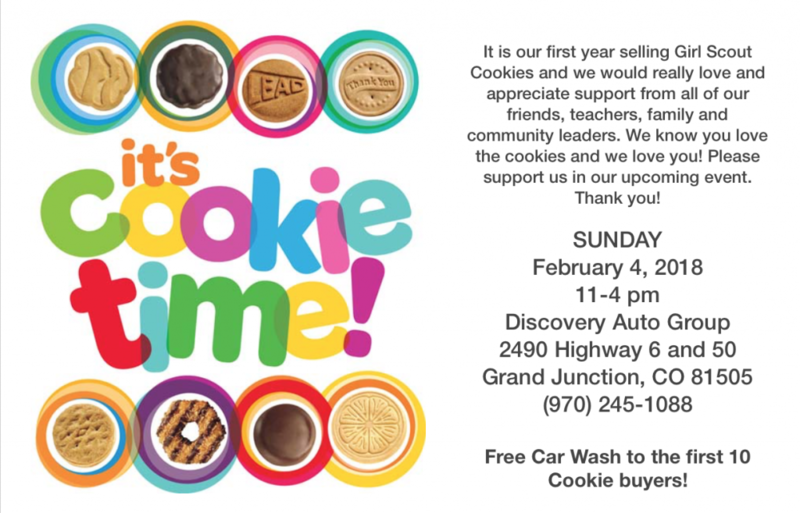 Girl Scout Cookie Sunday - Discovery Auto Group "Let the happy begin..."
You have come up with a great idea! We asked you what we… “we” meaning Discovery Auto Group in Grand Junction… might do to help local groups at our store. And you told us, “help the Girl Scouts sell cookies!” That’s a great idea. So, this Sunday, February the 4th, from 11 to 4, Girl Scout Brownie Troop leader Jennifer Nicols will bring seven absolutely adorable and very excited Brownies to our place. The girls are 7 and 8 years old, and this is their very first year selling Girl Scout cookies! We know you care about these young ladies and their cookie sale. So, please some to Discovery Auto Group, 2490 Highway 6 and 50, this Sunday the 4th from 11 to 4. Buy their cookies. Show them how great they are!